One thing is for sure, Manchester United's Champions League interest is over for another season after Tuesday's defeat at Barcelona, but thanks for joining me for reaction to that and Ajax's win over Juventus. 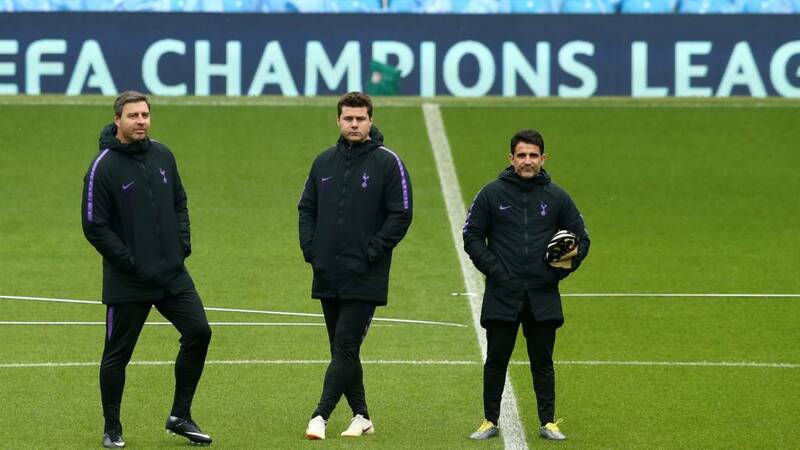 We'll be back later to see who will join Barca and Ajax in the semi-finals, bringing you live text commentary on Manchester City's clash with Tottenham and Liverpool's trip to Porto. What now for Man Utd? It's sad fact that three of the back four last night aren't fit for purpose. Young, Smalling and Jones don't fill anyone with confidence and that is reflected in how the team play. Sort out the back four and things will start to improve. Signing Harry Maguire would be the right move. As a start. Ole's job is to clear out the deadwood? Hasn't he just given a lot of the deadwood new contracts?!? Just as defensive as Mourinho, but worse at it. Fun times ahead. People have been going on about United needing to rebuild and have a massive clear out since the Moyes fiasco - five years, three managers and hundreds of millions of pounds later and they're still largely in the same boat. How much longer can Woodward keep his job? Liverpool lead the Premier League with four games left, although Manchester City have a game in hand. The next side City hope can take points off Liverpool is Cardiff this Sunday (16:00 BST), and the Bluebirds will be playing for their Premier League survival having kept alive their chances of staying up by winning 2-0 at Brighton on Tuesday. And Cardiff manager Neil Warnock praised his side's "guts" after goals by Nathaniel Mendez-Laing and Sean Morrison secured a third away victory of the season. Liverpool have a 2-0 advantage heading to Portugal and have never lost a European match against Porto in seven previous encounters (W4 D3). The Reds also condemned Porto to their heaviest home defeat in European competition in last season's Champions League, winning 5-0 in a last 16 tie. But Liverpool boss Jurgen Klopp said: "Porto always have a high intense game in the highest intensity atmosphere. From the first kick, they will go with a clear direction. "If we were 2-0 down and going into the home leg, would we think we were out? No way. That's exactly what Porto are thinking." Although Liverpool are yet to win the Premier League, they were Champions League runners-up last season and look set to reach the semi-finals for a second straight season. They visit Porto later with a 2-0 advantage from the first leg, with defender Dejan Lovren and midfielder Alex Oxlade-Chamberlain both being left out of the squad after missing training on Tuesday. Centre-back Lovren started in the first leg but is now suffering with illness, although Joe Gomez is available after recovering from a leg fracture sustained in December. "Dejan had a bad night, the doctor was there and he had no chance to travel," said manager Jurgen Klopp. "If you feel not well and had a bad night, we all know an intense game the day after doesn't exactly sound like the thing you should do. "We have Joe [Gomez] so we should be fine for that position." Oxlade-Chamberlain is closing in on a return to senior football after a year out with a knee injury. Meanwhile, Jordan Henderson has travelled after being forced off in the win over Chelsea with an ankle problem. Philippe Coutinho and Raheem Sterling were two of Liverpool's key men as they chased the Premier League title in 2014. They ultimately fell short, with Manchester City claiming their second Premier League title in three years. But Sterling's career has gone to another level since making a £44m move to City in 2015, helping them win a third Premier League title last season. Manchester United and Chelsea are said to be interested in Barcelona midfielder Philippe Coutinho but Barca president Josep Maria Bartomeu says the 26-year-old Brazilian will only be allowed to leave if his release clause, thought to be £355m, is met. That story features in today's gossip. The former Liverpool man has faced criticism from the media and Barca fans since moving to Spain and pointed to his ears after scoring a superb goal to seal Barca's 3-0 win over United on Tuesday. Julian Gold: It's not just about Messi, it's about a team that can both keep and pass the ball fluidly and rapidly. Man Utd too slow, too sloppy, too inconsistent and that has been obvious since Athletic Bilbao humbled us in 2012. Need proper reboot now, not just tinkering. Sulaimon Adelekan: Now Manchester United must rebuild which will certainly take time and patience. It's time to separate the boys from the men, time to separate quality from quantity. In Ole's word it will be the survival of the fittest. Now, with the Champions League gone - Barcelona having been spared the unlikely comeback that stunned Paris St-Germain in the last round - Ole Gunnar Solskjaer must confront the battle to get Manchester United back into the tournament next season. Paris was a sporting miracle,but sporting miracles do not happen often and this cold correction of football logic showed that United - this United - do not belong in such exalted company. This is a situation years in the making but now it is Solskjaer's to resolve. Ole, as the song always says, is at the wheel - and it may be a rocky road ahead. Shuvam Sinha: Ajax depending on young talents, United depending on Young's talent. Bezaleel Adewumi: Sir Matt Busby passed on the baton to Sir Alex Ferguson. Unfortunately, Sir Alex didn't pass on the baton when he left in 2013. David Moyes wasn't given time to understand the culture of Manchester United. Mourinho NEVER understood what Manchester United was about. ScillaciRam: Wrong to hire OGS. MUFC executive is taking them backwards. Transfers will not help MUFC. Their playing culture has gone badly awry. They need a major project (aka MCFC). Another player mutiny looms because that's easier than working harder. Across town, Manchester United boss Ole Gunnar Solskjaer has already begun a 'rebuilding job' after his side were knocked out of the Champions League quarter-finals by Barcelona. "We have said all along that this isn't going to change tonight and the next few years will be massive for us to get to the level of Barcelona," he said. "We have got good players and at the moment we really have done well to get to the quarters [of the Champions League] and to get in the challenge for the top four. Flags have already been placed in seats around the Etihad Stadium, which could be seen during Tottenham's training session there on Tuesday. Manager Pep Guardiola has challenged the Manchester City fans to create an atmosphere on Wednesday similar to the one when they beat Liverpool 2-1 in the league in January. Some City supporters have booed the Champions League anthem before games and tickets were only sold out on Tuesday. "I'm really curious how are fans are going to react," said Guardiola. "[An atmosphere like] the Liverpool game will be enough for me - a little bit better. I want to see if they [the fans] want to get to the semi-finals. "Do it for the guys - the last 20 months, they are so proud with what they have done but they are human beings. "They will have bad moments in the games and at that moment we need our supporters. "At this stage, without supporters, we cannot go through. I'm expecting." Manchester City midfielder Fernandinho has trained after missing Sunday's win over Crystal Palace with a muscle problem. Sergio Aguero was withdrawn late on at Palace but is fit, although Oleksandr Zinchenko (hamstring) is a doubt. Barry: Winks out tonight is a massive blow. Barely slept thinking about what City did to us in October with no creativity in our midfield. Big Vic [Wanyama] needs a big game and Alli, Eriksen will have to come deep to get on the ball and play Lucas and Sonny in. Barely slept a 'Wink' then Barry?? Manchester City and Tottenham play the second leg of their tie later, with Spurs holding a 1-0 advantage. Midfielder Dele Alli has been named in their squad but will be assessed before Spurs decide if he will play against Manchester City. Alli broke his hand in last week's first leg but has returned to training. Spurs forward Erik Lamela, who has not played since the last-16 second leg against Borussia Dortmund on 5 March because of a hamstring injury, has also trained and like Alli was due to be assessed after Tuesday's training session. On Alli, manager Mauricio Pochettino said: "We are going to have the last training session today and then need to decide if it's possible he can be in the starting XI or on the bench." Serge Aurier (hamstring), Eric Dier (hip flexor) and Harry Winks (groin) are all out, as is striker Harry Kane after he suffered an ankle injury in the first leg. Ajax are the first team from outside England, Germany, Spain, Italy and France to reach the Champions League semi-finals since compatriots PSV Eindhoven in 2005. They will meet either Tottenham or Manchester City in the last four. "We have incredible talents and, for our nation, it will get better and better," said Ajax coach Erik ten Hag. "We were not favourites, but with our philosophy we again exceeded our limits. "We know how to push boundaries every time. And with Tottenham or Manchester City there will be another challenge. We look forward to it." Former Arsenal and Barcelona winger Marc Overmars was another of the Ajax academy graduates to be sold off in the '90s. Now their director of football, he also enjoyed the win in Turin, by sliding along the pitch! Is De Jong Europe's next superstar? After reaching two straight Champions League finals, the Ajax side of the 90's was broken up with young stars such as Patrick Kluivert, Edgar Davids and Clarence Seedorf going on to enjoy more success with the likes of Barcelona, AC Milan, Juventus and Real Madrid. Could the same happen again? Frenkie de Jong has already agreed to join Barca in the summer. Video caption: Is Frenkie de Jong Europe's next big thing?Is Frenkie de Jong Europe's next big thing? What are those moves bro?! Matthijs de Ligt's Ajax team-mates sure enjoyed their win at Juventus too, showing off their moves in the dressing room after the game.